The testing call is now closed. Thank you so much for your support! The Davina Dress is now available in the shop. Frankly I am not sure whether to design something for the summer now, or start to think about designs for cooler weather. My solution is to come up with something that is adaptable for different seasons. And now Davina Dress is ready for testing. It’s a comfortable knit dress that can transition from the hot summer until the chilly fall. Are you interested to be a tester? 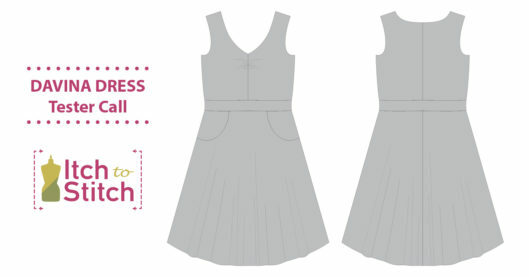 The bodice of Davina Dress is designed to be fitted. In fact, it has negative ease and the knit fabric stretches to fit the body for a very fitted look. Below the fitted bodice is a half-circle flare skirt to add a bit of twirl factor. Use light to medium light-weight knit fabric with at least 75% two-way or four-way stretch. Jersey, matte jersey, interlock and very-light weight French terry are great choices. If you use fabric with less stretch, you may choose a larger size. Conversely, if you use fabric with more stretch, you may choose a smaller size. The same fabric is used to line the bodice. However, if your knit fabric is on the heavier side, you may choose to line the bodice with a lighter-weight knit fabric. Jersey and tricot are great choices. I plan to start testing Monday, August 17th, and would like to receive your modeled photos with the dress by Monday, August 24th . But as always, if there’s any important change to the pattern, we’ll extend testing as needed. Please sign up below if you are interested. Testing is one of the most crucial steps for producing a quality pattern. I appreciate your applying! ← Carey Top Pattern Released!